On September 13th 1757, John Childs completed the first flight in America. 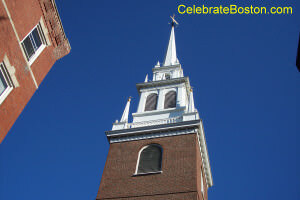 Tethered to a rope, and attached to a feathered glider, he flew about 700 feet from the steeple of the Old North Church to the ground. He had placed advertisements in the Boston Gazette preceding the event, and many spectators attended. Brandishing pistols on his third flight, and with local business completely disrupted in the area, the town leaders barred him from any more sorties. Childs advertised in the newspapers to publicize his flight-plans. The Boston Gazette of September 12, 1757 listed the following announcement: "This is to give notice to all gentlemen and ladies, that John Childs has flown off of most of the highest steeples in old-England, and off the monument by the Duke of Cumberland's desire, and does intend this day, and two days following, to fly off Dr. Cutler's church, where he hopes to give full satisfaction to all spectators." "[Last] Tuesday in the afternoon John Childs, who had given public notice of his intention to fly from the steeple of Dr. Cutler's Church, performed it to the satisfaction of a great number of spectators; and Wednesday in the afternoon he again performed it twice; the last time he set off with two pistols loaded, one of which discharged in his descent, the other missing fire, he cocked and snapped again before he reached the place prepared to receive him. It is supposed from the steeple to the place where the rope was fixed was about 700 feet upon a slope, and that he was about 16 & 18 seconds performing it each time. As these performances led many people from their business, he is forbid flying any more in the town. The said Childs says he has flown from the highest steeples in England, and off the Monument, by the Duke of Cumberland's Desire."